Architectural metal canopies are important design elements over entrances and windows. 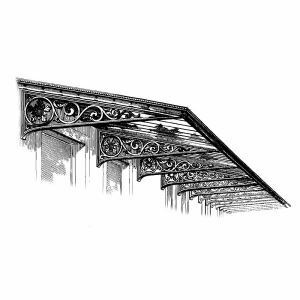 Historical Bronze canopies are used for both historical restorations and new construction. Available in a variety of ornamental metals including bronze, aluminum or copper, these canopies to built to withstand wind, rain and snow loads for years to come. Featuring an enclosed look with columns, railing, and over head decor, this elegant canopy will add personality to your home or building. Customize for your needs.